Not only did he teach by accomplishment, but he taught by the inspiration of a marvelous imagination that refused to accept the permanence of what appeared to others to be insuperable difficulties: an imagination of the goals of which, in a number of instances, are still in the realms of speculation. Testimonial on Tesla’s 75th birthday, Tesla Museum, Belgrade, Serbia. In Margaret Cheney, Tesla: Man Out of Time (2001), 86. 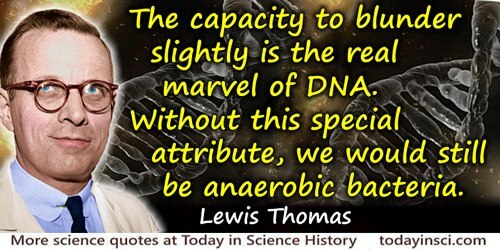 The capacity to blunder slightly is the real marvel of DNA. Without this special attribute, we would still be anaerobic bacteria and there would be no music. The greatest marvel is not in the individual. 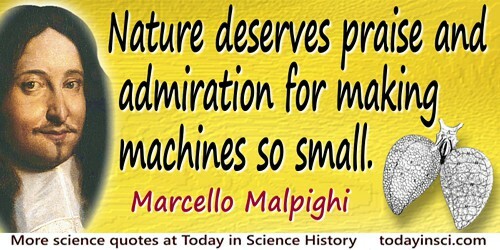 It is in the succession, in the renewal and in the duration of the species that Nature would seem quite inconceivable. This power of producing its likeness that resides in animals and plants, this form of unity, always subsisting and appearing eternal, this procreative virtue which is perpetually expressed without ever being destroyed, is for us a mystery which, it seems, we will never be able to fathom. 'Histoire des Animaux', Histoire Naturelle, Générale et Particulière, avec la Description du Cabinet du Roi (1749), Vol. 2, 3. Trans. Phillip R. Sloan. This law [of gravitation] has been called “the greatest generalization achieved by the human mind”. … I am interested not so much in the human mind as in the marvel of a nature which can obey such an elegant and simple law as this law of gravitation. Therefore our main concentration will not be on how clever we are to have found it all out, but on how clever nature is to pay attention to it. In The Character of Physical Law (1965), 14. O earth, and what is your lap sending forth? Hiding under the lava? Are they who had fled returning? Come and see, Greeks; Romans, come! Ancient Pompeii Is found again, the city of Hercules rises! Translation as given, without citation, as epigraph in C.W. Ceram, Gods, Graves, and Scholars: The Story of Archaeology (1986), 1. There are other translations of the Schiller’s original German, for example, in 'Pompeii and Herculaneum', Life of Schiller: Poetical Works (1902), 249.